Living life to the fullest requires complete freedom. Good thing Florence-based company Marvis has created the ultimate mouthwash for those with a zest for fast-paced living and good food. 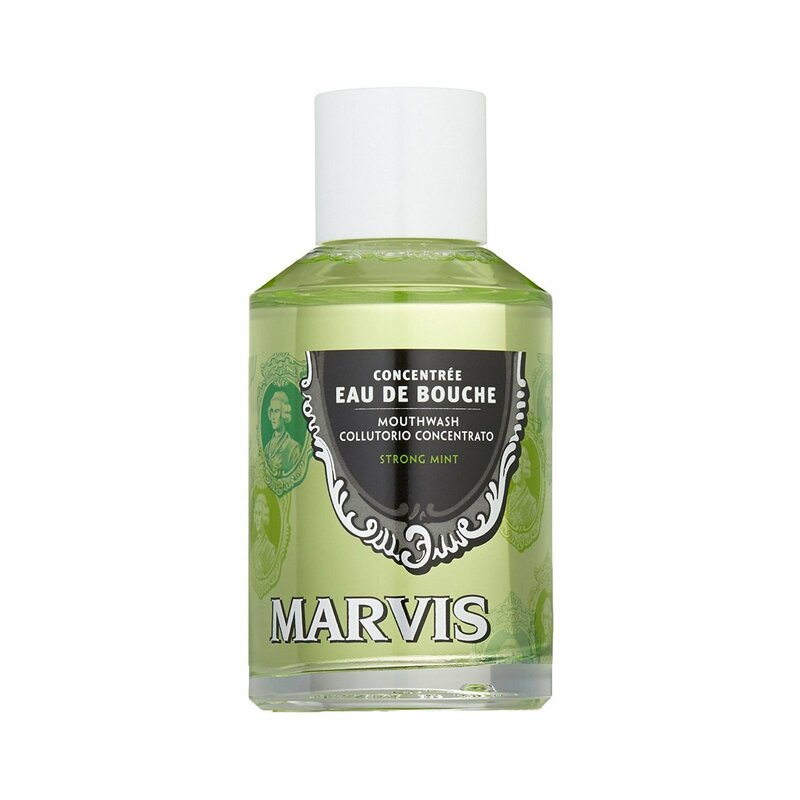 The new Marvis Mouthwash Concentrate Strong Mint cleans and energizes with a peppermint extract and a blend of aromatic herbs. Natural xylitol and propolis extracts also provide protection against bacteria and prevent cavities. Made with no alcohol, this mouthwash is soft on the gums and skin while cleaning the entire mouth and offering a refreshing sensation. To use, dilute one part of solution in four parts of water and rinse for 30 seconds. 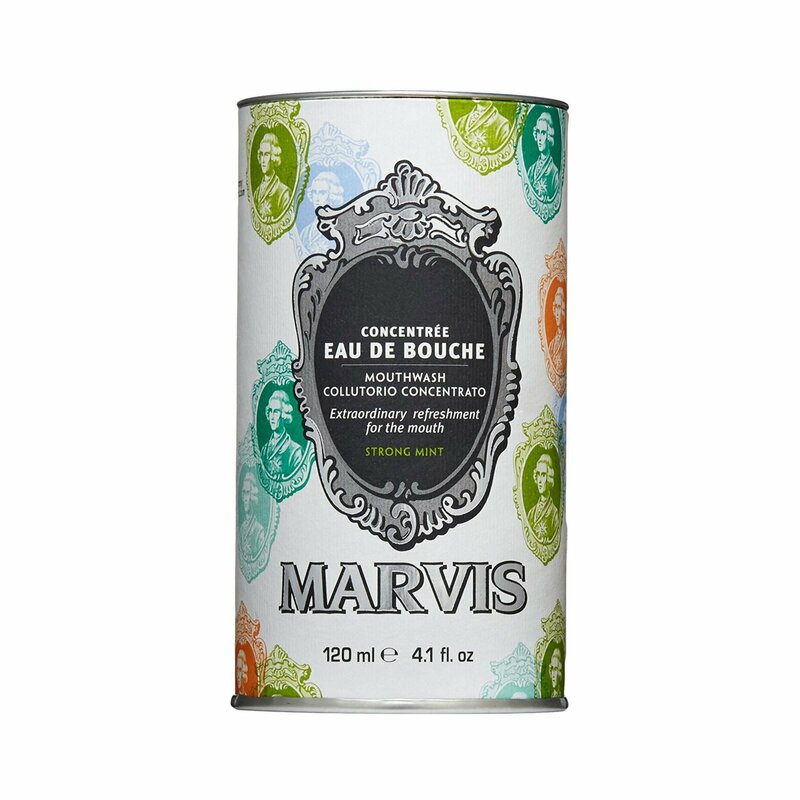 A true Italian product, the Marvis Mouthwash Concentrate Strong Mint comes in beautiful packaging with an intricate design. Suggested usage: Dilute one part mouthwash with four parts water—this formula is highly concentrated. Ingredients: Water, Glycerin, Poloxamer 407, Sodium Lauryl Sulfate, Flavor, Propolis Extract, Sodium Saccharin, Xylitol, Sodium Benzoate, Benzyl Alcohol, Citric Acid, Limonene, CI 42090 (FD&C Blue no. 1), CL19140 (FD&C Yellow No.5). More: This product is cruelty-free and formulated without alcohol or gluten. Marvis is known as a superior dental brand, beloved in Italy for generations. Gessato is an authorized retailer of Marvis products. We purchase all of our Marvis products directly from the company in order to bring you genuine items that represent the best in contemporary design. Every Marvis product in the Gessato shop is authentic, comes with official brand packaging, manufacturer’s warranty (where applicable), and is sold with Marvis's authorization.